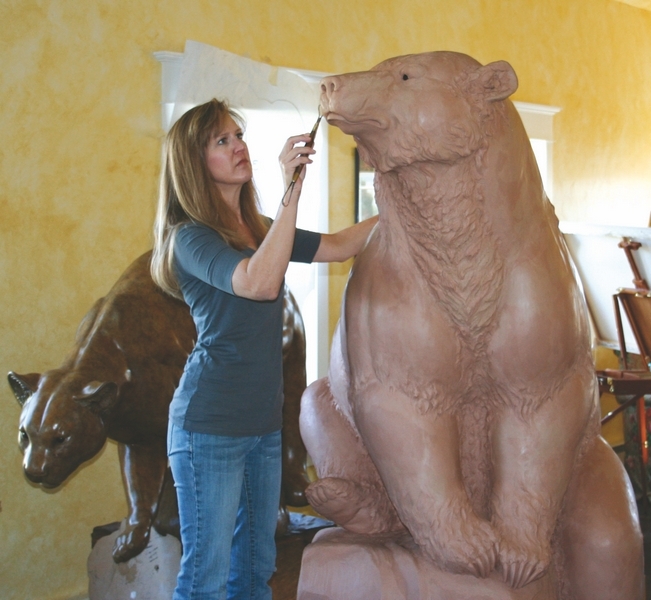 Born in Colorado, Melissa was raised with the appreciation of wildlife and art. Both of her parents are established artists, her mother a china painter and her father a sculptor. For 10 years she assisted her father in finishing pieces at the foundry level before ever sculpting work of her own. With the basics behind her, her work has evolved into the style you see today. From monument size cougars and bears that will stare you down to tabletop bunnies that will steal your heart. Melissa has a natural ability to capture the spirit of life and emotion in each of her sculptures. The face is the most important part of the piece, the place where she can most express herself. It is also the most detailed area of her pieces, as she tends to portray with rest of the body with smooth lines and simplicity. She refers her style as “realistic impressionism” and “robust or fluffy”. She uses patina as another way to express texture in her work. Although Melissa has found her own style she insists she is still evolving. Melissa works out of her studio in Littleton, Colorado. She has two grown children and her family comes first, her work second. Most importantly “I give the lord the thanks for the gifts he has given me”.